The Renaissance Scholars program is steaming ahead this term! Community Engagement Producer, Julia Mendel, has updated us on the exciting excursions and lessons the students have undertaken so far. We’ve hit the half way mark for the Renaissance Scholars Program of Independent Thought with Granville Boys High School and we have covered a lot of ground. 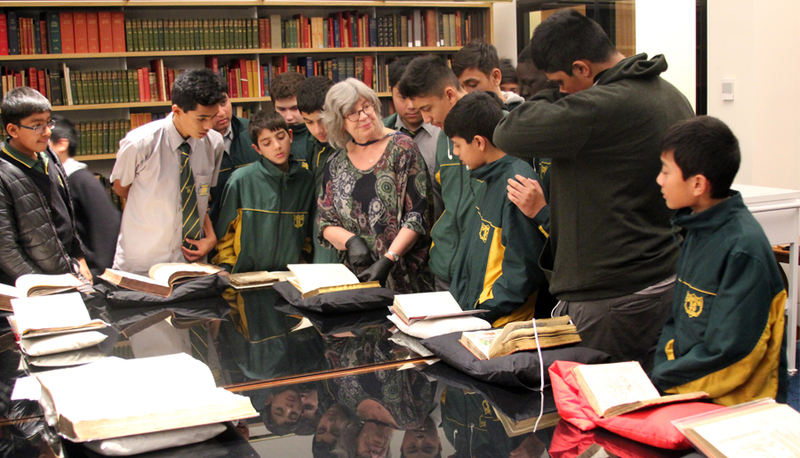 Each week the Granville Scholars visit experts from a range of disciplines including artists, astronomers, curators, researchers, musicians and academics. Week 1 curator, John Murphy showed us around the city, including St Mary’s Cathedral, Art Gallery of NSW and the NSW State Library. Week 2 we visited the astronomy team at Macquarie University to view their planetarium and telescopes plus a fire dance from Samoan dancer Tito Schmidt. This week we also worked with artist Keg De Souza to build domes at Artspace in Woolloomooloo from recycled materials. Week 3 combined trigonometry and astronomy looking at how the sun can be used to measure distances. Week 4 used VR and drawing to explore perspective with artists Josh Harle and Catherine O’donnell at Artspace. Week 5 Professor David Ryugo and musician Tom Ellard presented their findings on hearing, the brain and memory at the Garvin Institute.